We're plunging beneath the waves to find today's custom wallpaper imagery inspiration: sea life. In the briny deep you'll find all sorts of animals deserving to find a place of prominence on your wall. From dolphins and sharks to majestic coral reefs and even sunken ships, there is no lack of variety to draw upon for a sea life wall mural. 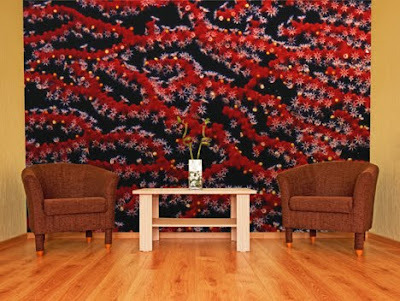 The custom wall mural in the inspiration room showcases an image of a red gorgonian sea fan. The sea fan is a type of soft coral, this variety hailing from the Indian Ocean. The deep, rich reds may be the main attraction of this mural, but notice the smaller flower-like objects scattered over the branches. These are polyps that only appear at night. Their flowery appearance has a slight Asian flavor that we really like. We have quite a collection of sea life images for you to choose from. Some of most popular sea life murals are columns of coral, as well as schools of fish. A school of fish, all packed in tightly together, has an inherent pattern like quality already, to create a more static wallpaper look as opposed to a photographic wall mural. As with any of our images, they can be manipulated to suit your taste and decor as closely as possible.